As I've mentioned in my previous post, when it comes to handmade gifts, I make them very often and I don't expect some sort of immense gratitude. It is what it is :) And I don't ask people to take photos while wearing/using something I've made. That's almost a rule for me. 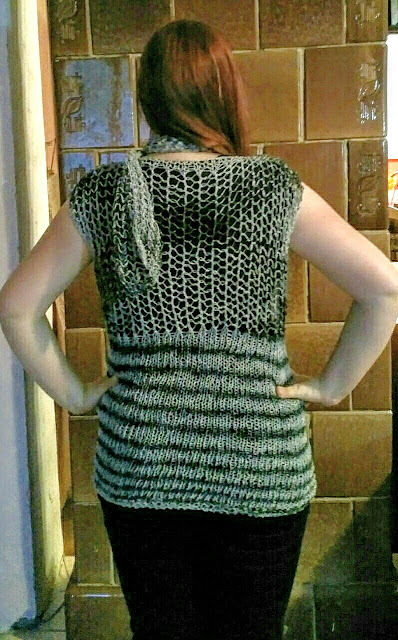 So when I designed and knitted No Trouble Mesh Set for my sister in law Dana, I was very careful about asking for a photo. I explained how I want to take my blog more seriously since I have time right now, how I liked the way the whole thing turned out and if she would be so kind to take a few pictures once she tries it on, no big deal. And she was thrilled to help me, so I was too and I prepared it all. The photos I took were there just in case. 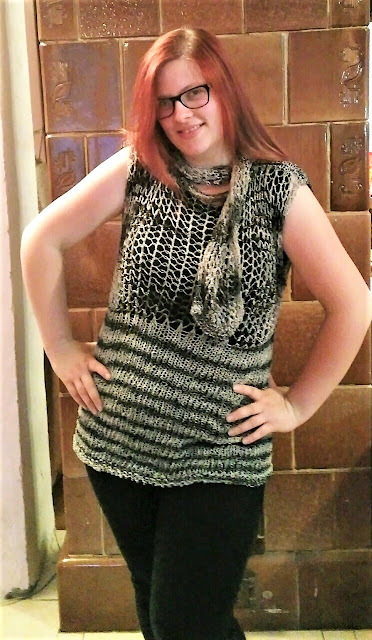 When I published the pattern, I was hoping to get her photos in a day or two and add them to the post. On the upside, when I complained to Dean about his sister, he just said: "Who cares?! Why do you even need her photos?" And as usual, he was right. After all, he has seen all the things I've made these few years in Innsbruck. The gauge was the same, 9st to 10cm, but I've made the adjustments for the size, to fit chest 92cm. It went something like this: 92*9/20=41,4, then rounding up and adding 2st makes 44st for each upper part in mesh pattern. As things usually work out just fine, as soon as I started my new top, Dana sent me her photos. I guess nothing mysterious was going on after all. Still, I believe I was right not to ask for this kind of a favor so often. It's a great way to make things awkward, isn't it? I just found your blow from your pattern on Ravelry!! Love this pattern!! Cannot wait to see more! Sorry for the typo...meant blog..